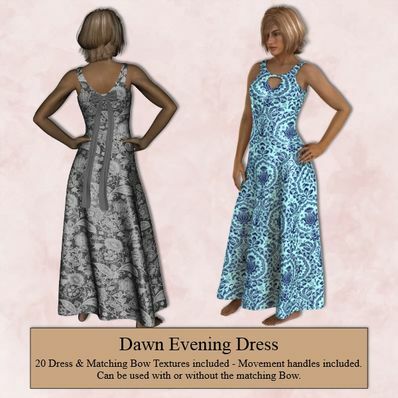 An Evening Dress for Dawn for use in Daz Studio 4.6. Several textures for the Dress and matching bow included. I forgot to say I LOVE THIS DRESS... this is so exciting. My adrenalin is flowing wildly as I find new items to try, thank you! Test comment - please ignore. I love this dress... Thanks for sharing!